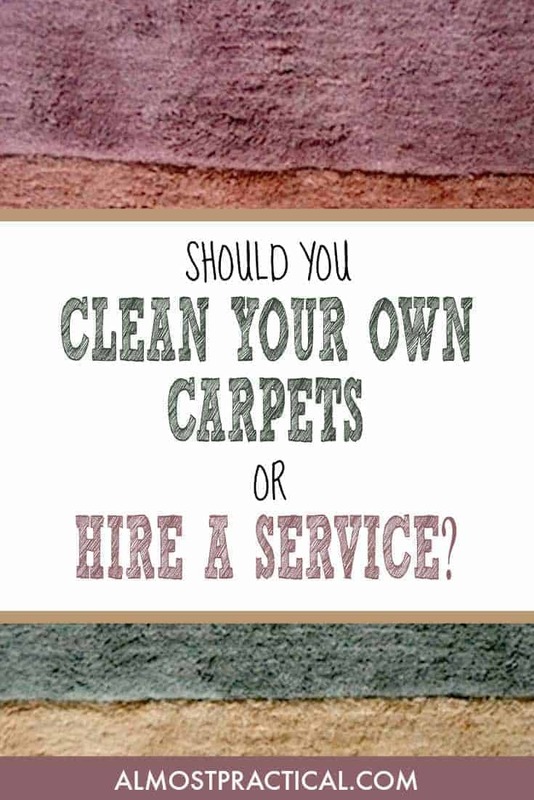 Should You Clean Your Own Carpets or Hire a Carpet Cleaning Service? Cleaning the carpet in our family room is on my list of spring cleaning tasks. Should I Hire a Carpet Cleaning Service or Just Clean My Own Carpets? The big debate is whether you should buy your own deep cleaning, carpet cleaning machine or just hire someone to do it. Is Your Home Fully Carpeted? If your home is fully carpeted – meaning that you have carpeting in just about every room, you might want to hire someone. This might come as a surprise – because you might think that if you have a lot of carpet, it would be cheaper to do it yourself. But actually, I think you might get a good deal from a carpet cleaning service on a whole house cleaning. And cleaning all those carpets yourself will take a good chunk of your time. Do You Have Carpet in Just a Few Rooms? If you only have carpeting in a few rooms, personally, I would buy a carpet cleaning machine. For example, most of our home has hardwood floors. We just have carpeting in our family room. Hiring a carpet cleaning service to deep clean one room doesn't make sense to me. It is very expensive and I think I would get a better deal if I had more than one room for them to clean. For that reason, I bought a deep cleaning carpet machine and I have been very happy with that decision. It takes me about an hour and a half to clean the room and shampoo the rug. I usually only do this once a year, so it is not a big time commitment. All I have to do is set aside some time in the spring. Do You Clean Your Own Carpets? Is shampooing your rugs on your spring cleaning list? Do you plan to do it yourself or hire a service? Carpets are the main air filters of the home as they hold dust, pet remains, germs. So, properly cleaning of them is must and should be a part of cleaning every time.